The tremendous growth in new applications is changing Commercial Real Estate for the better and fast. Everyone--brokers, property managers, developers, and tenants-- benefit from the new tools that boost productivity while saving cost. Keep an eye on these trends emerging in the CRE market through 2017. It’s about time the cloud became an important feature in CRE business. The capability to share information makes project collaboration and transactions more productive. Everyone, from stakeholders to managers, views the current status immediately and in real-time. Using electronic signatures in place of multiple copies of paperwork speeds up the contract process and keeps the data more secure than shuffling around binders from multiple parties. Cloud-based services are especially useful when using the IoT (Internet of Things) as BuildingIQ does to manage the sensor network monitoring clients’ energy consumption. Part of the cloud’s computing power is its ability to process huge quantities of data from multiple sources in real time. Now CRE officials have access to huge quantities of data right at their fingertips. Access to easy reporting and dashboards are providing property managers, investors, and developers with new insights and opportunities to streamline services. Now smart investment decisions can be made within days not months. 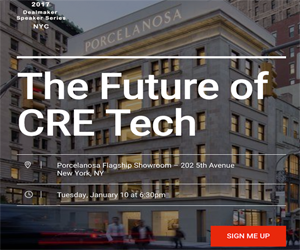 Rescour is a top data aggregator in CRE, but other more-focused tools are using data aggregation like Aquicore’s property management software and PropertyMetrics valuation software. Now with smart and affordable sensor technology, property managers can adjust conditions in real time across multiple units based on information provided by instant reports. Enlightened’s smart sensors can tell the difference between people and objects, monitor light levels and adjust automatically, report on energy usage and much more. It’s among the many new tech companies allowing retailers can analyze information at locations hundreds of miles apart, seeing the building’s system status and traffic flow to make better business decisions. Amongst sensor tech benefits: boosting energy savings and helping properties go green. Expect sensor technology to become a selling point for commercial properties. Today’s brokers, investors, and developers are constantly on the move, which is why mobile support applications make sense for CRE. Now these busy professionals can conduct business anywhere at anytime: completely transactions seventeen floors up at a construction site, sharing documents from the car, oversee project management while at a conference, mobile is the way to go. Apto is an example of a cloud-based app app used by brokerage firms. Today’s CRE tech interfaces are easy-to-use and minimize the need for special training. The applications are designed to integrate into the CRE workflow with simplicity. Property Matrix, a cloud-based property management software, touts its simple design and single-panel navigation amongst its user benefits. Virtual reality is a buzzword in the real estate industry. The technology provides investors with the opportunity to view the property without traveling to the location. Customers walk through using a controller for navigation. Matterport is a company leading the way into virtual reality for CRE with $58 million raised of May 2016. While VR and 3D imaging is currently expensive and used primarily for high-end properties, innovations will surely lead to decreasing overhead, making this technology more accessible across CRE. Innovations will continue at a rapid pace through 2017. With companies now catering to the needs of CRE professionals, expect more products using cloud-based software to provide new ways to enhance productivity and drive cost savings for the ever-mobile industry.